A long line of shoes lies abandoned outside the private tatami rooms of Kenzan, awaiting the diners celebrating within, and denoting this as one of Melbourne’s top special-occasion Japanese restaurants, a position it’s held since the 1980s. 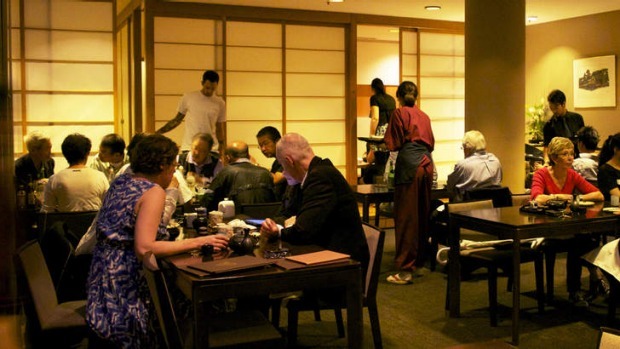 The main dining room, with sushi bar to one side, is comfortable; the quietly tasteful decor belying the happy atmosphere created by talkative groups, international tourists, families and couples. The main menu follows a traditional path: gossamer battered tempura, classic sushi, or sukiyaki – wafer-thin beef and vegetables cooked at table in elegant copper pans; but several specials offer some thrills, such as tuna belly chopped with spring onions for crunch in sushi rolls, and clams steamed in sake and served in smoky broth with snow pea leaves. Shiitake mushrooms stuffed with prawns and deep-fried in light batter are inviting bites. Wine service may lack polish, but maroon-suited staff charm, right up to a warm farewell that follows an equally appealing caramel-crusted green tea brulee. And … The restaurant is named for Edo period potter Ogata Kenzan, who died in 1743. Worst bit The off-the-mall entry.